This 16-week plan averages 70 miles (112 km)/week with 5 - 7 runs/week (2 of which are optional). It includes easy runs, long runs, threshold runs, VO2max intervals, and repetitions. The long run starts at 13 miles (21 km) and peaks at 21 miles (33 km) in week 12. 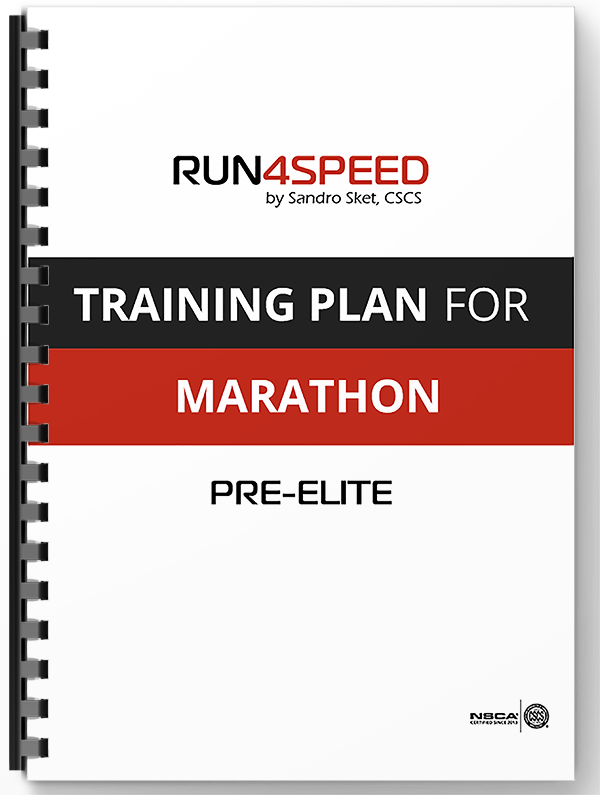 4SPEED™ funnel periodization – designed to enhance your general endurance, lactate threshold, VO2max, and neuromuscular power specific to the demands of the marathon. In my opinion, the most suitable training progression for competitive road runners is funnel periodization (see graphic above). Since its short cycles continually train - or at least maintain - the full spectrum of physiological skills, it allows for multiple peaks within one season and seamless transitions to different race distances. 2. Pre-Competition - This is the fitness phase with a strong focus on VO2max and lactate threshold. If you discover that the level you have selected is too hard or too easy for you, simply contact me for a free exchange.